As we first reported back in March of last year the City is rebuilding a new and improved Alder street between 18th & Broadway. Initial work is starting now with EWEB doing it’s pre-construction maintenance work on site starting this week (see update below). This is going to be a busy summer of construction so be prepared for many detours, construction zones, and closures. A BPAC subcommittee is working on construction zone signage and detour improvements so if you see any dangerous situations for cyclists (like poor sign placements or unsigned closures) send us a photo (after you call it into the City at 541-682-4800) and we’ll pass it on for use in that work. On Tuesday morning , May 17th EWEB will begin work at the north end of Alder Street. Alder Street will be closed from Franklin Blvd to 11th Street from Tuesday, May 17th at 7:00am until Wednesday, May 18th 5:00pm. Work will then continue south between 11th and 13th Street but the traffic lane will remain open. Bike lanes and parking will be closed. 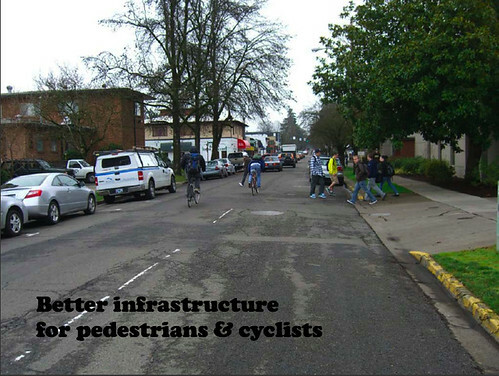 The purpose for this road and bike disruption is for EWEB to perform work for the upcoming City of Eugene Road Reconstruction Project . EWEB is beginning to replace water service lines, relocate fire hydrants and adjust utility vaults on Alder Street from Franklin Blvd. to E. 18th Ave.